First we were the contract laborers and then the professionals and middle-class immigrants. The latest chapter in Asian-American history is the story of refugees. Among others, large numbers of Cambodians have escaped the suffering of civil wars. With this perspective in mind, Chanthoeun To and I shared one bright idea, which was to initiate an organization to help Cambodian students and to open up a door for future generations. In strengthening our organization, we were also outreaching to the Cambodian community of Hawaii. Despite a small population of 150 Cambodian people living in Hawaii and only 12 Cambodian students at UHM, our motivation did not keep us from reconstructing/representing the Cambodian cultural memory and to give voice to all aspects of our existence in the United States. Cambodian Students at the University of Hawaii at Manoa (CSAloha) is a newly formed student organization consisting of both graduate and undergraduate from various disciplines (e.g. Sociology, Anthropology, Architecture, Business, Law, Psychology, etc.). For most Americans, Cambodia is an unknown or forgotten land. For many, its is only recognized as the land of the "killings fields." One of our primary objectives as a newly formed student's organization is to expand this limited view of Cambodia by providing an informative, intellectual and current event. Other supporting objectives include: 1) to promote an understanding of the Cambodian people and culture, 2) to raise awareness of ethocultural identity as refugees living in America, 3) to promote unity and cohesiveness in the Cambodian-American community and 4) to instill a sense of "consciousness" about the responsibility and roles of the Cambodian people among Cambodian-Americans and Cambodians. 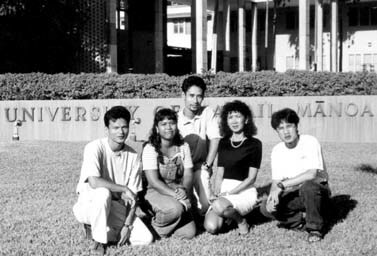 Since UHM is a campus consists of students from all over the world, it serves as a great diversity and unity among the people of Asia/Pacific. Last year, May 2nd 1998, the first official "Cambodian New Year" was celebrated in Hawaii. It was held at UHM, where a full day of festivities and celebrations took place for the full day we called "First Annual Khmer New Year Cultural Gala". The whole day of celebrations started out with the chanting of monks and was followed by a cyber trip to Cambodia via Internet Access and finally the official New Year celebration with entertain programs such as fashion show, traditional games, dance and music, poetry citing, classical dances and much more. Cambodian families have long celebrated "Cambodian New Year" as an annual holiday, however, this was the first celebration because for the first time ever in Hawaii, it was opened to the public not just for Cambodian families. This event was a big challenge for all members of the organization and despite the first time experience, it was all gracefully put together. These are some of our organization's perspectives. We urgue Cambodian students to form organization(s) at their colleges and Universities.